Rabbi Aryeh Lebowitz serves as the Mara D'atra of Beis Haknesses of North Woodmere and is an eleventh grade Rebbe at the DRS Yeshiva High School (HALB). Rabbi Lebowitz grew up in the Five Towns community and spent two years learning in eretz Yisrael at Yeshivat Kerem B'Yavneh , where he developed a close relationship with Rav Ahron Silver, who taught him his derech halimud and encouraged him to pursue a career in Klei Kodesh. Upon his return from Eretz Yisrael, Rabbi Lebowitz attended Yeshiva University’s Sy Syms School of Business, where he majored in finance. 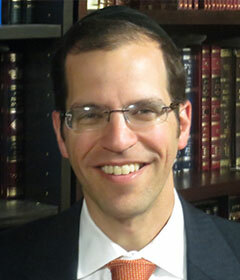 Rabbi Lebowitz has published numerous articles on practical halachic topics in various journals, including several recent articles in the Journal of Halacha and Contemporary Society. Prior to founding the Beis Haknesses of North Woodmere, Rabbi Lebowitz spent three years as Assistant Rabbi at Congregation Sha’aray Tefillah in Lawrence. While at Sha’aray Tefillah, Rabbi Lebowitz also served as the Rosh Kollel of the morning kollel, one of the foremost centers of adult education in the Lawrence community.